In 1861, 1871, it was referred to as Square. The local Pace Egg Play is performed here. In 2008, a modern sculpture – a 10 ft high replica of a fustian-cutter's knife – was installed in the square. There are many quarries in the area. The name was originally Cabbage Lane. The name was changed at Anne Lister's request when St James's Church opened in 1832. Runs between St James's Road and Pellon Lane. Leads west from Clare Road. Recorded in 1874, 1911 and 1936. Rev George Edward Aspinall owned property here and elsewhere in Southowram . A part of Copley model village. Named for the church of St Thomas the Apostle which opened in 1860. Hill at Salterhebble on the A629 which leads up into Halifax from Huddersfield and the south. This is part of the main road from Halifax to Huddersfield, which comprises Ward's End, Commercial Street, Portland Place, Prescott Street, Skircoat Road, Spring Hall,, Huddersfield Road, Salterhebble Hill, Huddersfield Road, Elland Wood Bottom, Halifax Road and Calderdale Way. Motorists travelling from the M62 and Huddersfield to Halifax will be aware of its steep and twisting ascent into the town. In 1903, the gradient of the hill was reported to be 1 in 9.69. This was significant for the growing tramway system. Because of the gradient, the Tramways Committee considered installing a large lift to raise the tramcars from Salterhebble to Dudwell. J. H. Whitley visited the USA where similar lifts were in use. The road runs from the junction of Blackwall and West Parade, through Bell Hall, to Savile Park. Before 1933, the section west of Savile Hall is named Bull Close [before 1842] and Haugh Shaw Lane, Halifax [from 1842]. Runs west from Harrison Road to Savile Hall, where it joins Savile Park Road. Most of the houses here are known by name though some are referred to by number, and some by both at different times! Question: Can anyone clarify any confusion/duplication in the information in the Foldout? Section of Savile Park Road. Formerly known as Ludhill Lane. Recorded in 1841 as being near Granny Hall. Question: Does anyone know who the sculptor was? Row of terraced houses off the A6033 Rochdale Road at Shade. Area of South Parade and The Shay. Runs from Ovenden to Holmfield. Recorded in 1854, 1851 and 1861 as Shaw Lane. Recorded in 1761 as a name for Skeldergate. Takes its name from Shibden Hall. Aka Halifax Old Road, the section into Halifax becomes Lister's Road as it passes over the Godley Cutting. Number 21 & 23 were listed as a part of the Shibden Estate in a sale catalogue of October 1925. Recorded in 1875 as Victoria Street. The construction of the new road – at a cost of £750 – from Water Lane to Whitegate, Siddal was sanctioned in August 1907. It was built in 1913, to provide alternative access to Siddal. Recorded in 1874 off Haley Hill. An early name for King Street, linking Woolshops and Cripplegate, is recorded between 1500 and 1750. The road began in 1890 and opened on 29 August 1891. It was built on an embankment which had formed by years of tipping spoil from the Halifax Gas Works. In 1905, the filling had to be dug out and quenched after spontaneous combustion broke out. From Commercial Street and Ward's End, it followed the path of Caygill's Walk, and superseded the previous main road which ran below the Shay and up Shaw Hill into Huddersfield Road. The house at Number 139 was built as the home for the General Manager of Halifax Corporation Transport. In March 1976, it was used as office accommodation. It subsequently fell into disrepair. There was timber-framed house with an aisled hall here. It was cased in stone in the 17th century. This is discussed in the book Aisled Houses in the Halifax Area. Recorded in 1874 off Range Bank. This is the main street through Heptonstall. John Naylor lived here and established a school here for the young workers in the local mills. The Radical Hoil was here. Aka Spright Smithy. Recorded in the 18th century. There was once a stake to which horses were tethered for shoeing. Area of Woolshops. Recorded in 1874. There were a number of Common Lodging Houses here , including the Model Lodging House. Recorded in 1874 as part of Stannary off Corporation Street. The terrace of four houses on Savile Park Road, Halifax – first known as 7, 8, 9 & 10 South Grove – was built around 1860 for John Foster. A planning application for four houses was submitted by architect Richard Horsfall on behalf of John Foster, and approved on 27th April 1860. His brother-in-law Hiram Fell may also have invested in the project. The original hand-coloured application drawings can be inspected in Calderdale Archives [Ref: Mu:26/178, Plan No.466]. The terrace has a frontage of about 30 metres facing south and occupies a commanding position overlooking the later Rothwell Road. The name South Grove is carved on a stone tablet on the north wall of No.57, facing Savile Park Road. No.63 is larger than the other three houses, having 12 rooms as recorded in the 1911 census. This was the main road to Huddersfield until the present Huddersfield Road was constructed. The 19th century cottages here are listed. A continuation of Church Street to the south, extending from the bottom of Horton Street to the bottom of Hunger Hill. It is a now a part of the eastern by-pass of Halifax. House at the junction of Stafford Road and Skircoat Green Road. Built during the 18th century. Hanson says that this – and Middle Street – were the first rows of houses to be erected in the town, and that some of the houses had Venetian windows. In 1934, Halifax Corporation decided that it would compulsorily purchase properties in this densely populated part of Halifax, as part of a clearance programme. Recorded in 1881 and 1891. By 1911, it was known as South View. 10 houses on the western side of Halifax Borough Market overlooking Southgate. The street runs south from Elland Cross. Much of the 18th century and Victorian property here is listed. Major street in Halifax town centre. Runs from Corn Market to Ward's End. The steep hill-side road leading from Clark Bridge, Halifax and the foot of Old Bank up to Bank Top, Southowram. It is also an alternative name for Blaithroyd. There used to many workers' houses on the hill, as can be seen in the photographs. In 1870, the route was superseded by Beacon Hill Road, Southowram. The street was a part of the packhorse route from Lancashire to Halifax. In the 16th century, it was known as Pyghill Street. Local name for Lower Clifton Street, Sowerby Bridge. A row of houses are recorded here in 1804. The land was owned by Dr Richard Alexander and occupied by James Riley. Spring Garden School was built on land opposite the cottages. In 1829, there were 21 cottages on the site owned by Robert Sutcliffe. Number 17 was occupied by George Pickles  and became the White Horse, Friendly [18??]. A terrace of houses on Waterloo Road. In 1901, Numbers 20 to 28 Waterloo Road are listed as Spring Terrace. A terrace of 7 or 8 houses reached via Dog Kennel Lane from the main road at Bank Top, or via Middle Lane from Battinson Street. A group of single-storey houses on Castle Hill / Thornhill Road. On 19th century maps, it is shown as Square Lane. Formerly known as Nip Square and Square. There are a great many properties with names like Bairstow's Buildings, Clough's Court, Hanson's Passage, Richardson's Row Walker's Square and Nichol's Yard. Many of these were slums and poorer housing from the 19th century, possibly built by a mill-owner for his workers. Later offices and administrative buildings were given similar names, such as Princess Buildings. The Foldout collects some of these names. The property stands adjacent to the Shears, West Vale. The Arts & Crafts building was designed by J. F. Walsh for Mr Smith. Originally, the shoe shop was a single storey and the top bit was added on, though I don't know when. The boot and shoe shop was run by the Smiths. The shop front was replaced in 1914 when the business was run by Mr Percy Smith, (possibly) a son of the original Smiths. Before it was hidden by the new Co-op, the outline of the original Shears Inn could be seen as a white shape on the end wall of 6a Stainland Road, West Vale. Opened in 1824. This was said to be one of the most expensive of roads with a toll gate about every mile including those at Clap Lane, Bank House, Stainland, Rawroyds Mill, Elland, and Waggon & Horses, Holywell Green. The Shaw family were amongst the investors. In 1824, an Act was passed to create a by-pass from Holywell Green to Outlane. The trust ran out of money and the roads above Holywell Green were not improved. 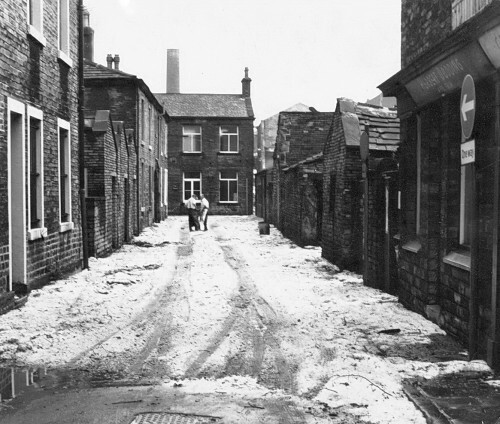 An area of Halifax comprising Alma Street, Cabbage Lane, Carpet Street, Corporation Street, Damask Street, Darley Street, Greenwood Street, Smith Street, South Darley Street, Stannary Street, Winn Street, and extending down to Dean Clough and the Hebble Brook. There were many houses and pubs in the area. The area was lost – and the occupants rehoused – in the 1960s when Burdock Way was constructed. A continuation of Cribb Lane, Halifax which went west to join Pellon Lane. Stannary Hall stood at the junction of Stannary and Stannary Lane. Recorded in 1845 and 1874 at 8 Northgate, Halifax. Staups House is recorded here . Originally ran to Hoyle House. After 1850, it was straightened to join Smith House Lane. The road was unmade – and lived up to its name – until Cliffe Hill County Primary School and Stoney Lane Housing Estate were completed in 1953. The Anglo-Saxon word straet comes from the Latin via strata [a paved road]. Some early streets – such as Ermine Street, Watling Street – were Roman roads. Or Sunderland Yard. North of Lister Lane, the yard backed on to Duke Street. Recorded in 1837, when John Turner (cabinet maker) was here. Cheapside in Salford, Todmorden. Built by John Sutcliffe. Hill at Caddy Field leading from Bailey Hall down to Stoney Royd. Recorded in 1874 off Gibbet Street. Area just north of Cow Green at the bottom of Gibbet Street/Pellon Lane. / Priestley Green Formerly Helliwell Syke Lane, the name comes from the Holywell Syke.